Sweet Violet (Viola Odorata) other names: Banafshah, Fleur de Mars, Garden Violet, Herba Violae, Neelapushpa, Sweet Violet Herb, Sweet Violet Root, Viola odorata, Violae Odoratae Rhizoma, Viole de Carême, Violet, Violeta, Violette Commune, Violette des Haies, Violette de Mars, Violette Odorante, Violette à Parfum, Violier Commun, Wild Violet, Zi Hua Di Ding. 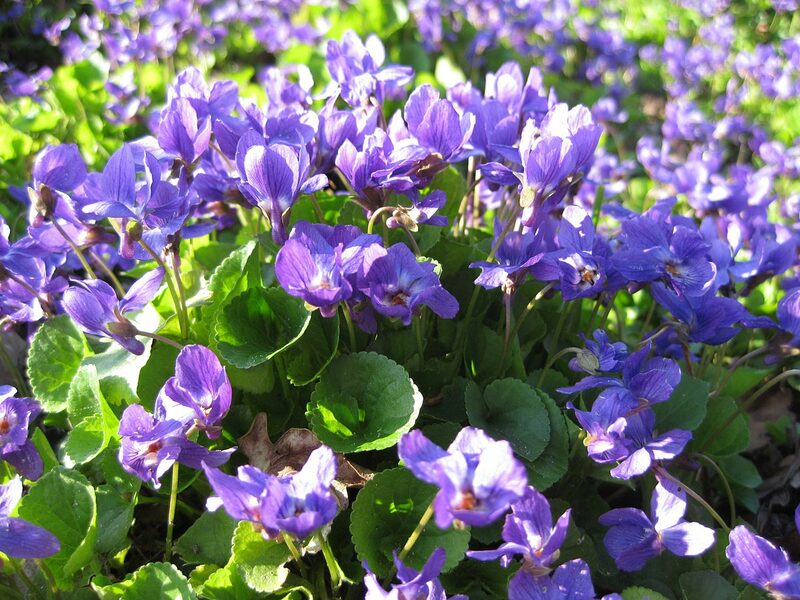 When the first exquisite and aromatic bluish-purple flowers of sweet violets gently sway in the meadows or the edges of the forest lands, nature lovers make out that spring has arrived. In fact, people marveled at sweet violets for over 2,000 years. In primeval Athens, people regarded sweet violet highly for the plant’s ability to cure insomnia as well as to restrain anger. Later on, the Celts blended the flowers of sweet violet with goat milk to produce a cosmetic. In 16th century England, people used sweet violet flowers to prepare syrup as well as in the form of a gentle purgative meant for children. They used this syrup for treating several ailments in adults, such as jaundice, epilepsy and pleurisy. In contemporary times, the flowers of sweet violet are mainly used in the form of cooling agents, in the manufacture of perfumes as well as cough syrups. During different eras and in dissimilar places, folk healers advocated the use of the sweet violet plant in the form of a remedy for problems related to growths. Ever since roughly 500 B.C., freshly obtained leaves of the plant have been employed in the form of a poultice to cure skin cancer. Unfortunately, people still continue to believe that the sweet violet plant is effective for treating cancer, despite the fact that there is no scientific matter to substantiate this claim. The sweet violet is indigenous to several regions of Europe as well as Asia, where sweet violet is a familiar plant growing along the pavements, in forest land and along the sides of roads. The sweet violet plant thrives in nearly all types of soils, but has a preference for a cool, damp soil that has a proper drainage and is rich in humus content. In addition, this plant grows well in dappled or partial shade and requires protection from blazing winds. When the plants are grown outdoors, they have a preference of a reasonably heavy, fertile soil, although they are able to endure limestone and sandstone soils. The sweet violet plants are resilient to approximately -20°C. Precisely speaking, sweet violets are decorative plants and they have several named varieties. These plants bear gracefully aromatic flowers during the later part of winter and in early spring, which are meant for fertilization by bees and because very few bees are around during this period of the year, the flowers rarely lead to seed production. Nevertheless, afterward in the year, the plants also bear a second variety of flower. Although these flowers do not open, they produce seeds inside them by means of self-fertilization. Often, the plants also freely sow by themselves provided the site is appropriate for it. When the sweet violet plants are growing robustly, they are also capable of spreading their roots rather very quickly. Sweet violet plants respond healthy to replanting annually provided the soil is loose and fertile. The leaves and flower buds of all plants belonging to this genus are comparatively edible. However, if the leaves and flower buds of the species that produces yellow flowers are consumed in large amounts it may result in diarrhea. Sweet violet is also used for digestive tract complaints such as abdominal pain, swelling (inflammation) of the stomach and intestines and the tissues that line them, digestion problems caused by improper diet, gas, heartburn, gallbladder disorders, and loss of appetite. The leaves and flowers of sweet violet possess mild expectorant as well as demulcent properties and they also promote perspiration. Frequently, they are employed in the form of an infusion or syrup to treat chest colds, coughs, as well as congestion. In British herbal medicine, the leaves and flowers of this herb are also used for treating stomach and breast cancers. The root of sweet violet herb is a comparatively potent expectorant and when taken in elevated doses, it has an emetic action. Sweet violet has been used in folk medicine since ages and has been found to be effective in many cases, particularly for treating whooping cough and cancer. Sweet violet encloses a compound called salicylic acid that is used for making aspirin. Therefore, it is natural that this herb is useful for treating conditions like headaches, insomnia and migraines. The entire sweet violet plant possesses anti-inflammatory, diuretic, diaphoretic, expectorant, emollient and laxative properties. Preparations using this herb are taken internally to treat asthma; bronchitis; coughs; throat infections; respiratory catarrh; as well as cancers of the breast, digestive tract and the lungs. Sweet violet is also used topically to heal throat infections as well as mouth contagions. You may use the fresh plant or harvest it when it is in bloom during the summer and dry it up for future use. The bluish-purple aromatic flowers of sweet violent possess emollient and demulcent properties. The flowers of sweet violet are used for treating conditions like biliousness and problems related to the lungs. The petals of sweet violet flowers are use to prepare syrup that is employed in treating health problems related to children. Compared to the other parts of sweet violet, its roots possess an additionally potent expectorant attribute. In addition, the roots also enclose an alkaloid called violine, which when taken in elevated doses has strong purgative and emetic actions. The seeds of sweet violet possess diuretic as well as purgative properties and have been used therapeutically to treat problems related to the urinary tract - they are believed to be especially effective for treating gravels. The whole sweet violet herb is also used to prepare a homeopathic remedy, which is believed to be effective for treating sporadic coughs as well as rheumatic wrists. The flowers also yield an essential oil that is employed in aromatherapy for treating fatigue, problems related to the bronchial tract, and skin disorders. The essential oil obtained from the sweet violet leaves and blossoms is also used for making perfumes. Roughly 1,000 kg of sweet violet leaves yield approximately 300 grams to 400 grams of absolute or concentrated oil. The flowers of sweet violet are also employed to add essence to breath fresheners. In addition, the bluish-violent flowers also yield a pigment that is employed in the form of litmus for testing alkalines and acids. In addition to the plant’s therapeutic, cosmetic and chemical uses, sweet violet is also employed for culinary purposes. The tender leaves as well as the flower buds of sweet violet may be consumed raw or after cooking. Normally, sweet violet is available during the entire winter. The leaves possess an extremely mild essence, but they become somewhat strong when they are mature. A very good salad can be prepared using the leaves and their very mild essence makes it possible to use them in large numbers, while the other leaves that have a strong essence may be added to make the salads more flavourful. When the leaves are included in soups, they make the soup more congealed, in the same manner as okra. Sweet violet leaves are also used to enhance the flavour of puddings and other foods. The leaves of sweet violet can also be used to prepare a tea. The bluish-violet blooms of sweet violet can be consumed raw. The flowers possess a mild sugary flavour and a slight aroma. They are particularly useful for garnishing salads, as they can be availed during late winter. Fresh sweet violet flowers are used to add color as well as essence to confectionery. The leaves as well as the flowers of sweet violet are also used to prepare a refreshing tea. An extract obtained from the leaves of sweet violet is used to add essence to baked items, sweets and ice cream.